Nancy brought in one of her “catch” from the weekend. Yesterday we reported that she called in and that she had caught a fish that she wasn’t sure what is was. Well here is a picture of it. It is a Hake, or some call it a Whiting, and this one was about 10 inches long. They caught a few others over the weekend. A few stripers were also taken today. Mike Parent had a catch-n-release today. He was fishing the northern part of the beach on the refuge during the incoming tide and got a 33″ fish on a Kastmaster. 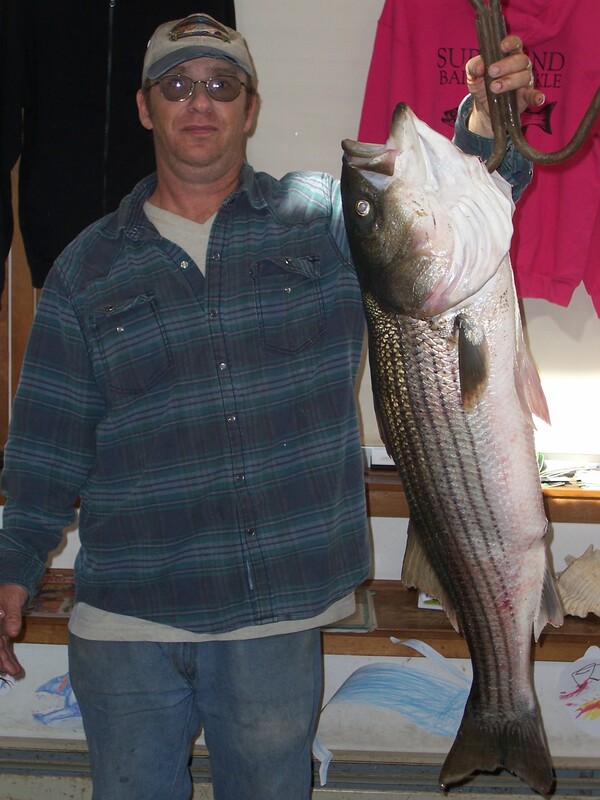 Below is a picture of Ron Kaufman from Wakefield, MA with his 23.10 pound striper that he also caught on the northern section of beach in the refuge. Ron, however, was using imported bait. He snagged some pogies yesterday in Boston Harbor and used them down here today. Do you guys remember when we had pogies (bunker) up here? They would run the beach. All you had to do was snag one and then live-line it and wait for the big stripers to come up underneath it and …………….gulp! From the boat……….. there wasa report of small bluefish being taken inside the mouth of the Merrimac trolling swimmers. …was in Sandy Bay (Rockport) late AM on Sun. A wide swath over toward Straitsmouth was filthy with tinker macks and birds. Again and again, the fish kept skittering across the H2O in numerous smaller pods, like they were being chased, and the birds were going nuts, but between me and two other boats, I didn’t see a single hookup in 45 min. I finally came to the conclusion that there in fact were no blues or stipers around, despite the macks’ frantic behaviour. …frustrating as hell; I wonder what this was about. Could be tuna, could be seals on those macks. …didn’t see anything other than those macs, and the water was exceptionally clear; I could see the schools swimming by my boat well below the surface. I have always been partial to surfcasting plugs and tins rather than bait. I believe I will go “Old School” and take the middle ground next season and try eel skins. Does anyone have any advice on where I may go to get plugs or leads that will start me on this strategy? The spotted hake is the specie in question. 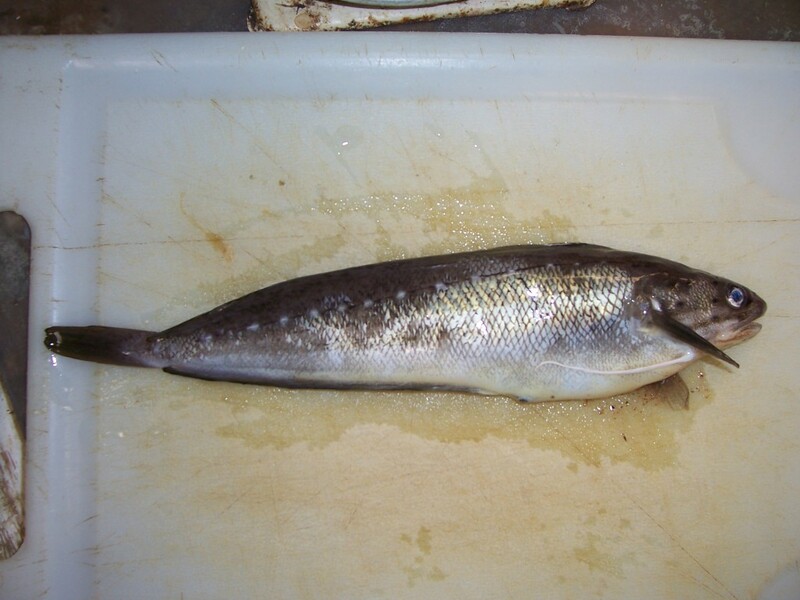 There are multiple hake species that are native to the gulf of maine. Whiting is a common name for the silver hake (very shiny). Whiting is a preferred live bait for tuna. They can be jigged up around muddy bottom-typically in water 30 fathoms deep or deeper. The spotted hake is quite common south of the cape.